Electronic waste export to Nigeria. Electronic waste export to Nigeria...Alaba International Market, one of the largest markets for electronic goods in West Africa. 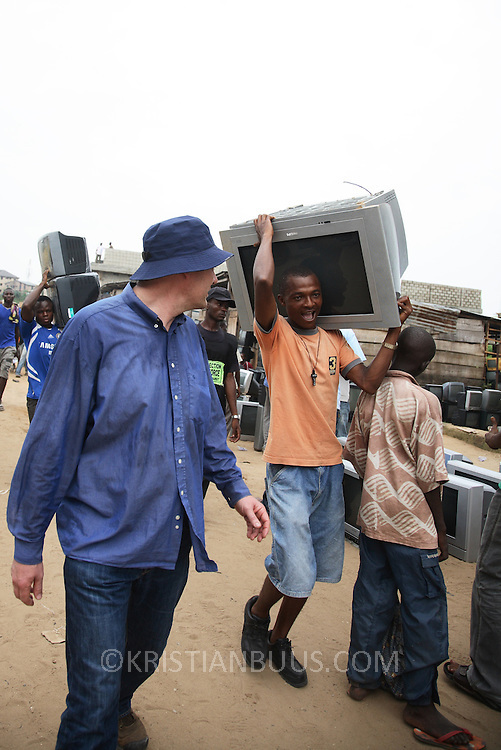 New and old - and a lot of non-working electronic goods such as TVs and computers come in to the market via Lagos harbour from the US, Western Europe and China...Eric Albertsen and his TV. The TV has travelled all the way from the UK and will now return as evidence of exports breaching the law...The shipment - TV-set originally delivered to municipality-run collecting point in UK for discarded electronic products - was tracked and monitored by Greenpeace using a combination of GPS (Global Positioning System using satellites), GSM (positioning using data from mobile networks to triangulate approximate positions) and an onboard radiofrequency transmitter (used for making triangulations in combination with handheld directional receivers used by team on ground) is placed inside the TV-set. The TV arrived in Lagos in container no 4629416.